East of the city centre, the district of Outremeuse ("beyond the Meuse") is an island on the River Meuse, starting at the confluence of the River Ourthe, whereof the name of the island, meaning "Beyond the Meuse", but most probably a deformation of "Ourthe-Meuse". Not particularly beautiful, this working-class neighbourhood of Liège is nevertheless worth mentioning for its unique atmosphere and culture characteristic of the downtown. It is one of the last places in urban Wallonia where one can still hear people speak Walloon on an everyday basis. Erstwhile, Outremeuse was the quarter of the tanners and the weavers, who worked along small canals (like in Bruges and Ghent), unfortunately filled up in the 20th century. In 1927, local journalists and celebrities created the so-called République Libre d'Outremeuse ("Free Republic of Outremeuse") as a Walloon counterpart of the Parisian République Libre de Montmartre, founded a few years earlier. Its boundaries are those of the parish of St. Nicolas, and its headquarters are located at 56, Rue Surlet, in what is also the Tchantchès Museum (see frame below). In 1959, the Commune Libre de Saint-Pholien-des-Prés was founded in the next parish of St. Pholien. That makes of Outremeuse a good example of what French speakers call the esprit de clocher (parochialism). Locals typically refer to the left bank of the Meuse as "the city", as if they weren't part of it. Outremeuse is the home of Tchantchès, a fictional street urchin who became sort of folk hero. According to the legend, Tchantchès ("John" in Walloon) was born miraculously on 25 August 760 between two cobblestones in Outremeuse. Drunkard since his childhood, deformed and ugly, the spirits of Tchantchès had himself elected Prince of Outremeuse by the local populace. He befriended Roland, nephew of Charlemagne, along the banks of the Meuse, and was introduce to the imperial court. Tchantchès then accompanied Charlemagne during his military campaigns, for only weapon his red scarf, for only armour his blue overalls, and for only helmet his black cap. He is brave, determined, always thirsty for freedom, but also subject to misplaced pride. At the famous Battle of Roncevaux, he is said to have slept over, which explained the defeat of Charlemagne and the death of Roland. Tchantchès is said to have died of influenza after a blow-out, at the age of 40 years old. 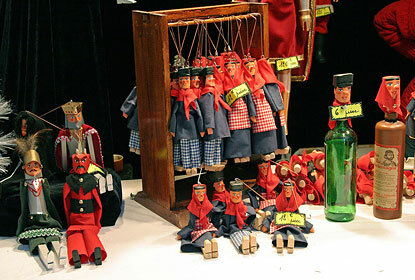 The character of Tchantchès was born in a puppet theatre in the early 19th century. References to the "emperor" were never clear and could have been meant to refer to Napoleon, who saw himself as the heir of Charlemagne. Nowadays, Tchantchès still embodies the rebellious spirit of the Liegeois. On 15 August each year, a big festival is held in Outremeuse in the honour of the Black Virgin. It includes a folkloric procession, puppet shows at the Tchantchès Museum, a huge 7-meter high bouquet of silk flowers, and a lot of drinking of the local peket (a kind of genever). Only a few typical, quaint streets have survived, such as Rue des Recollets, Rue Puits-en-Sock or Rue des Ecoliers. 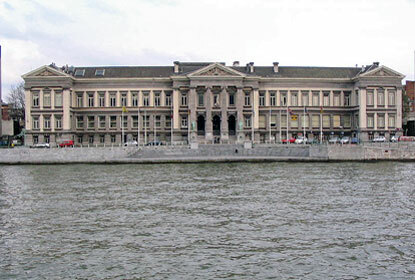 The western embankment of the island is home to the Aquarium-Museum of Liège, which comprises a natural history museum, and an aquarium of 2,500 fishes, invertebrates and reptiles of 250 species. Famous local people include the medieval writer and historian John of Outremeuse (1338-1399), the classical music composer André Ernest Modeste Grétry (1741-1813), and the novelist Georges Simenon (1903-1989). Aficionados of Simenon will recognise some of the neighbourhood descriptions in his books. The best way to reach Outremeuse is via the Arches Bridge (Ponts des Arches) in the continuity of Rue Léopold starting at the south-eastern corner of Saint Lambert Square.